Have you written a fiction novel or a nonfiction book that you would like to publish? It's more simple than you could imagine. "...a 'must' for any aspiring self-publisher..."
If you would like your book cover to meet LSI, IngramSpark or CreateSpace's requirements, please send us your cover in 300 dpi resolution in .tiff, .jpg, or .pdf format. Also, please send along the original LSI (or IngramSpark or CreateSpace) template for your book in PDF format. Turn around on cover conversions is usually 24 hours after we've received your files. Monday–Friday, regular business hours, Pacific time. If you are having problems with your cover, we can probably fix it! If you are new to the POD or ebook publishing fields, and need advice to get started, look no further. We provide reasonably priced consulting services at $40 per hour. Contact us via email and send us your list of questions. We will review your list in order to be prepared for your call. We have five years of experience in the POD and ebook publishing field, which includes providing advice to numerous authors and publishers about publishing in general, as well as technical advice and services regarding submitting covers and files to LSI, IngramSpark, CreateSpace, KDP, etc. In addition, we have converted over 100 cover files for LSI and CreateSpace for our satisfied clients. It is our goal to help authors and publishers become successful, independent publishers. Thank you for thinking of Diamond Press. We produce interior book blocks that meet CreateSpace, Lightning Source and IngramSpark requirements. We produce book cover files that meet CreateSpace, Lightning Source and IngramSpark requirements. * The price of $35 includes converting a cover image to LSI's required 240% ink saturation limits. Please note that applying this requirement to the file will produce a color change (usually dulled colors). To prevent this from happening, submit cover files that meet the 240% ink requirements. If this is not possible, please know that we do our very best, using Photoshop adjustments, to keep your image as close to the original colors as possible. Exact matches, however, are impossible. Satisfaction is guaranteed before payment is due. 4. And many more file formats. Just ask! We also convert Word files to ePub ebook files. NCX included. Please contact us for a customized estimate for your ePub conversion project. We convert JPEG, TIFF, and other RGB image files to CMYK. We convert JPEG, TIFF, and other color images to grayscale CMYK (or RGB). Also, please send a link to your publisher or author website, so we can verify that you have the authority to request the cover image upload. I have extensive (more than 25 years) of experience in proofreading, editing and copyediting. For copyediting, I adhere to the Chicago Manual of Style, which produces a manuscript that meets professional, publishing industry standards. We use either Microsoft® Word or Adobe InDesign to produce book interiors. Both novels and technical manuals are produced with the highest attention to detail and synergy of design elements. 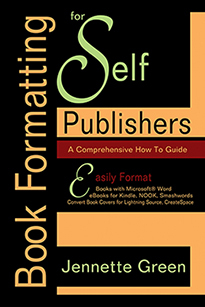 Conversion to Lightning Source and CreateSpace standards is included in the price. * At this time, we rarely take on additional website clients--please contact us with your details for more info. "Diamond Press has been nothing less than efficient, economical, and professional in formatting our book interiors. Jennette's meticulous attention to detail makes her services invaluable to publishers!" -Dr. Rocco L. Martino, BlueNose Press, Inc.
"Thank you for your excellent work and fast turn around." ~ Bill Bremer, Author of "Kingdom Relationships: Now and Forever" and "Being and Doing: to the Glory of God"
"I just wanted to thank you for all your work and the time you spent helping me get my files ready for LSI. I'm so impressed with you and your work and I will definitely be recommending Diamond Publishing." ~ Wyatt Knapp, Onagocag Publishing Co.